Betway are one of our recommended best betting sites for existing customers, boasting a free bet club, loyalty points and good honest regular odds and offers. If you are a footy fan and you needed another reason to bet with Betway they have re-launched their 4 to score promotion free prediction game for this season. 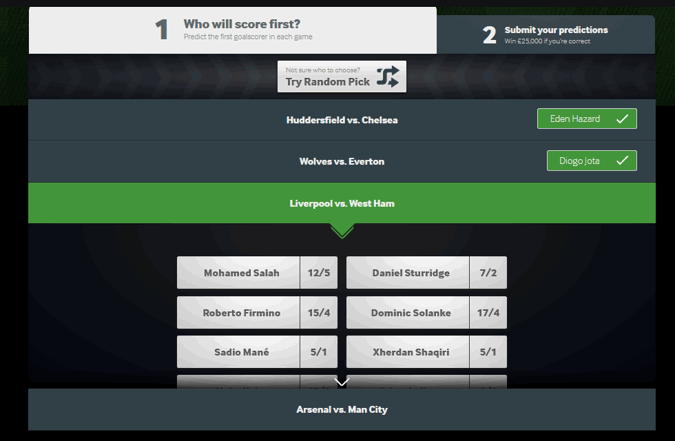 The game has now been modified, instead of picking the first team to score each week from England’s top four divisions you now just need to pick the first goalscorer in 4 selected weekend fixtures. 4 to score is available weekly and is free to play for Betway account holders. 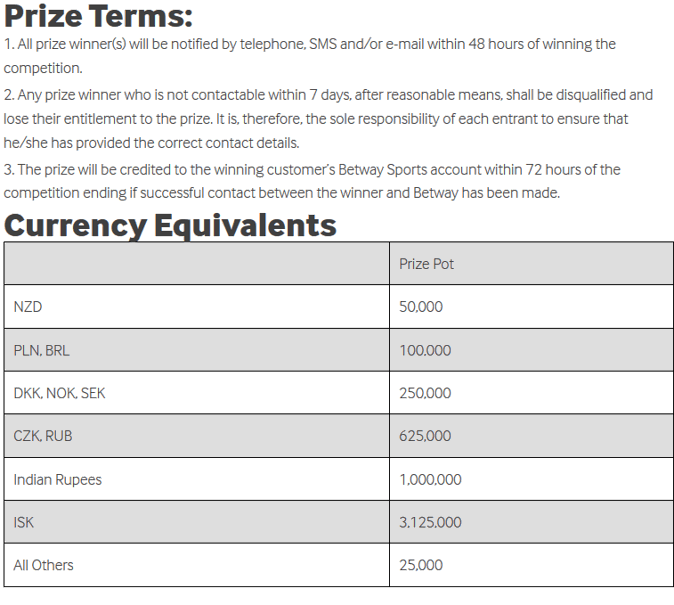 The winners, or winners are paid £25,000 in cash, and if no one wins the prize rolls over to the next week. If you win you will be contacted within 2 days and the prize will be credited to your account within 3 days. The offer also applies in Euros and in other currency equivalents. There is no catch on the winnings, it is honest real cash that can be withdrawn, even if you’d never placed a bet with the site before. You will however need to pass identification verification before you can withdraw, this is a legal requirement with all betting companies. When you pick your scorers for each match each player is also accompanied by the odds, helping you in selecting players you know less about. In general the matches will be Premier League but can also be from other English divisions or other English and European cup competitions, such as the FA Cup and Champions League when relevant. To play all you need is an account. You don’t need to bet or deposit to play, and all account holders get one prediction free each week. If you do want to bet Betway have a very generous introductory offer you could also claim, you can read about the full terms of this in out Betway review. Any winner will be contacted by phone or email within 2 days and prizes credited, as cash, to your account within 72 hours. If a match is postponed then your selections remain if the game is rescheduled withing 2 days. The BBC is used to determine who first goalscorers are. If you pick a player not on the field at the time the goal is scored then that is bad luck, it helps to think about who you think will actually play in the game and then pick your most likely or fancied scorer. Considering this is free it really is a good deal, it only takes seconds each week to select your picks and considering you could win a £25,000 it’s certainly worth having an account with Betway. For more terms or to play 4 to score click below.